VATICAN CITY (CNA/EWTN News)—At the end of his December 11 general audience Pope Francis reflected on the feast of Our Lady of Guadalupe, Patroness of the Americas, extending his greetings to all on the American continent. “Mary’s embrace showed what America—North and South—is called to be: a land where different peoples come together,” the pope said. 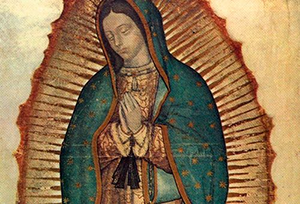 Following his discourse given in St. Peter’s Square on the last part of the Creed, in which believers proclaim their belief in “the resurrection of the body,” the pope drew special attention to the Dec. 12 feast of Our Lady of Guadalupe, Patroness of the Americas. “I would like to greet all my brothers and sisters on that continent, and I do so thinking of the Virgin of Tepeyac,” he said. “When Our Lady appeared to St. Juan Diego, her face was that of a woman of mixed blood, a mestiza, and her garments bore many symbols of the native culture,” reflected the pope. “Like Jesus, Mary is close to all her sons and daughters. As a concerned mother, she accompanies them on their way through life [and] shares all the joys and hopes, the sorrows and troubles of God’s people, which is made up of men and women of every race and nation,” the pontiff observed.